Park Hang Seo, the Korean head coach of the Vietnamese national football team, has been appointed as ambassador for his native Sancheong county in Gyeongsang province, the Republic of Korea (RoK). The appointment comes following his great contributions to promoting the image of both the RoK and Sancheong county. Park Hang Seo’s influence has spread not only in Vietnam and the RoK, but also across Asia. 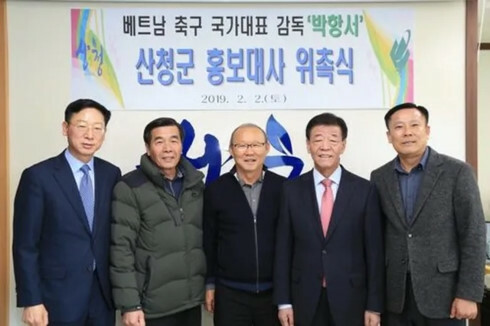 Local Sancheong county leaders hope that his influence will bring a positive impact on the culture and tourism of the region. They also noted that Sancheong county will increase their exchanges with Vietnam in the future. As a result of the miracle that the Korean coach has brought to Vietnamese football, leaders hope that more exchanges can take place in the fields of economics and culture. Park Hang Seo will soon return to Vietnam to prepare for the 2020 AFC U-23 Championship, the Fifa World Cup’s 2022 qualifying rounds, and the 2019 SEA Games.